I'm human. I have thoughts, feelings. morals and emotions. That's really describes us all. And as you should be aware, you will tend to gravitate towards those that share ideals similar to your own. Also, you notice famous folks that have a quality about them you admire. You may not really have that quality deep within you - it may be something you wish you were but never achieved. One of my personal heroes is Dr. King, but not for the reason many others have. Let's cut to the chase - Martin Luther King, Jr. did nothing for me to assist my social status. Really, he didn't. I grew up in a white, middle class neighborhood. When I was a kid, I only saw African Americans on the television or the cover of an album. My school was all white. There were a few of Asian heritage, and a couple that were Latino, but not one black kid went to my grammar school. It wasn't until junior high that I attended school with someone black, and by then the whole civil rights deal was 10 years in the past. So I don't look upon Dr. King for what he did, but for who he was. And that was someone believing in something so strongly that nothing would stop him. Not threats of violence, words of humiliation of even death. King kept doing what he did because it was a belief he could not give up. There are many times I wished I held an idea so strongly in my heart that nothing would let me sway off course. I guess my wife and kids would be that. I am a pretty staunch blue stater, but never jumped in with both feet to support my political feelings. Gavin, at Baseball Card Breakdown, though - he has a conviction that is quite important in his heart. All should know about his yearly "pull tab awareness" week. I can say that I avoid scotch tape all together and just use painter's tape when it comes to the card sleeves and holders. To Gavin, it's super important, and a recent PWE really told me how. All total, Gavin slipped about a dozen cards in a PWE to me. 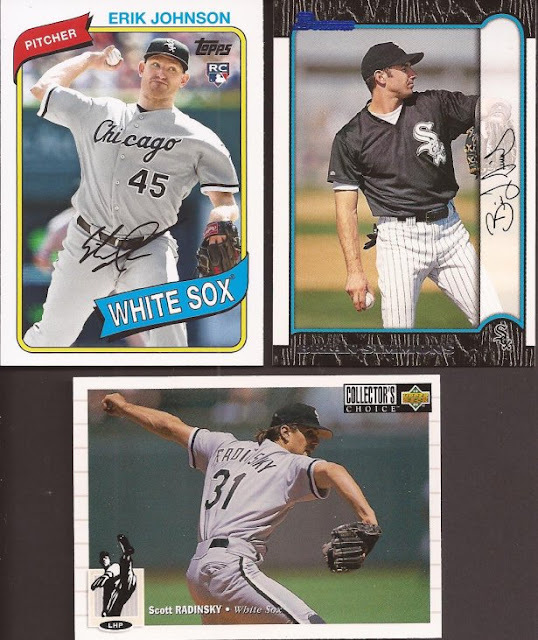 He helped out with a bunch of White Sox cards from the past years, including that really poorly framed Bowman. 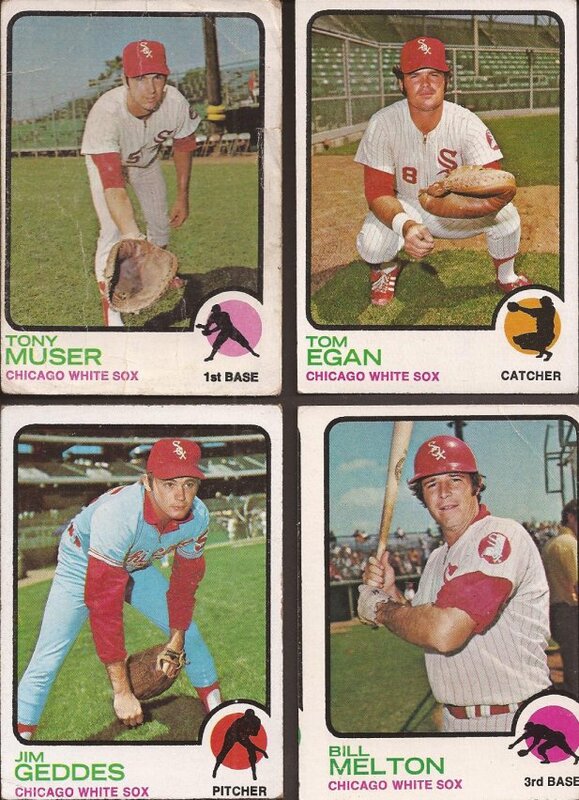 Someone also looked at my teams set needs and sent over these four '73s. The Muser up top probably had a former life in some kids spokes, but that makes it much more enjoyable. Beltin' Bill Melton will be a placeholder, since a miscut of that beauty has a better address in it's future. 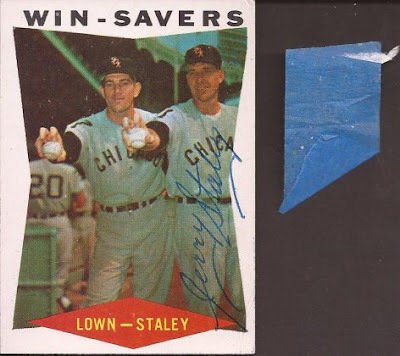 The real surprise is this '60 Lown/Staley win savers with a nice Staley auto on it. I tried to see if there was a TTM address for Turk Lown, but he doesn't seem to return much. I think the star of the package, though, is on the right. That is the actual piece of painter's tape Gavin used to attach the note to the outside of the team bag. Gavin pull tabbed tape attached to a piece of paper! It didn't work in the way Gavin purports, as you can see a small bit of the fibers in the top right. But when you have a conviction, you see it through at all times, never faltering nor wavering from your course. Man, you scared me for a second.. thinking the tape took off a piece of the card! Glad it's ok.
And hey, my whole thing is that pull tabs make it easier to remove. I never said blue tape is perfect. It'll usually come off clean on toploaders and team bags, but paper not so much. Pretty much all the blue tape I use in trades in recycled from other incoming packages of cards I've gotten. And good call on The Call.. there's a great forgotten band. According to sportscollector.net, Lown signs for a donation to the Cystic Fibrosis Foundation. I've been meaning to send my ATCRCS out, but haven't gotten around to it. love the call. i am sad to say that i stood behind michael been at a brmc show a few years ago without knowing it. would have loved to have talked to him and told him that 'i still believe'. Scott Radinsky looks like he is going all Chris Sale with that pitch.